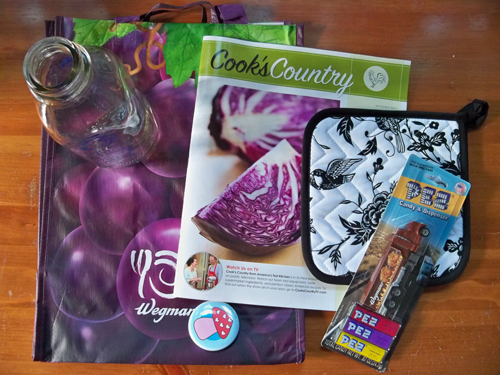 For a chance to win this fabulous prize package all you have to do is leave a comment stating what is your favorite dish to cook or bake! I will randomly choose a winner on the last day of the month, September 30. My favourite dish to cook is pulled pork. With plenty of leftovers for sandwiches. YUM. I don't really cook, but I bake a lot. My favorite thing to bake is my mom's banana bread. chicken tikka masala from the pioneer woman. it's really good! I like cooking any type of noodle or rice dish which probably stems from spending 6 years of my childhood in korea. I love to cook! I only get 1 to choose?! lol I especially love to make Quiche Lorraine. So easy and my whole family loves it! Good for breakfast, lunch or dinner & delicious paired with a salad. short ribs with spicy kimchi - yummmm! Macaroni salad! It's pretty boring I guess, but it's my favorite and sometimes when I make a big batch, I eat it for every meal! Grilled chicken and homemade mashed potatoes! I'm definitely not the cook in the family, though I do make a mean omlette with spinach and cheese. Chicken Spaghetti a la Pioneer Woman! I really enjoy making varieties of Asian chicken salad! Because it reminds me of my days as a college freshman, I love to cook Kraft Macaroni and Cheese Original, following the tried and true directions (I believe that means half a stick of butter, and a 1/4 cup of whole milk). That magic orange powder cannot be improved upon -- it's its own special flavor! Big pans of lasagna for my family! I love to make pizza - never ending topping possibilities, and you can make more than one kind for dinner and try a variety! Hmmmm, I just have to go with anything in the crockpot. There is just so much comfort in crockpot cooking and coming home from work to a house that smells delicious! my favorite dish to cook is butternut squash risotto. pure comfort food! Happy 10 years! My favorite dish to cook is a combo: beer lime black bean chili & old fashioned mac & cheese. I like making chicken teriyaki. It's simple and pretty quick--my go-to meal. lately i've been enjoying cooking baby food! i like making thanksgiving dinner. all of it! i am a pro. Eeeeee!! Happy 10 years to my favorite blogger!! My favorite dish to cook would be my mom's vietnamese sour soup. Lately though, Nick & I have been making dinner out of Alton Brown's Early Years and eeeeverything in there is delicious!! I like to cook spaghetti carbonara! Happy 10 years! Wow! Ten wonderful years! My favorite dish is roast chicken. one of my favorite dishes to cook are molten lava cakes. mm mmm, can't go wrong with chocolate. I have been on a seaweed kick for a little while, so my favorite thing to make is SPAM MUSUBI! Chili! Especially now when there is a little bit of fall in the air. I've been perfecting my recipe over the past 15 years. In another 15 I may have it just right! Ina Garten's macaroni and cheese - I love cheese! Chicken Cacciatore with chicken breasts, potatoes, red bell peppers, onion, mushrooms, fresh tomatoes, sauce, oregano, garlic, black pepper, splenda, and wine to taste. I love making Chinese Beef Shank Stew in a crockpot. The key is 5 spice. Cook chunks of shank for at least 8 hours till the meat falls apart. Yum! Just one? Sheesh!! Apple Spice Cake is way way up there, I suppose. :) Happy 10th Anniversary. I've probably only been reading 8 or so years, but it has been a looong time. Congratulations, I have enjoyed your blog for years! Favourite dish to make (this week) is a tomato salad, gently heated, with a drizzle of balsamic and olive oil. Eaten with crunchy toast. Summer! Pot roast in the crock pot. My husband loves it and I love seeing the expression on his face when he digs in. I love making lasagna! Especially when it's cold out. vegan Taiwanese dumplings, because you always have to do it with 3 friends to make that 100 count package of wonton wrappers disappear. and then you can't accidentally eat all 100 by yourself. because you SO can. Currently it's Rachel's Lentil Soup from Bob's Redmill Lentil packaging. Congrats on 10 years! I can't remember how long I have been reading, but you always have interesting things to show and talk about! I suppose I have two favorite dishes: crepes with maple syrup or lemon and sugar for breakfast and homemade white pizza for dinner. I have two favorite things to cook. On dark winter days I love to bake bread, and at dinnertime roasted veggies always get my vote! Congrats on your 10th. Chocolate chip cookies. I love to bake almost anything, but there's something to say for the "classics." It has to be Lemon and Poppy Seed cake for me. It's a great recipe that uses the juices from the lemons to make the cake nice and moist. Hmmm. Might have to bake myself one tonight. my favorite dish is shepherds pie! mash potatoes, ground beef, cheese, beans... how could anyone not like it! yummm..
My favorite dish to make is a pig pan of baked rigatoni, with cheese and red sauce and bits of sweet sausage and cheese, and...did I mention cheese? My favorite would be Cheesecakes! Happy blogiversary! My favorite thing to cook changes; these days, I'm about quinoa. I know, not a dish, but a great healthy shortcut food. We eat, along with a quick curry or tofu/veggie mix. And I use the leftover quinoa to make fried "rice" later in the week. happy anniversary! my favorite thing to bake is cupcakes - from scratch or from a mix, they always make me happy! I think a really tasty casserole might be my favorite. Amish Casserole with a nice garlic bread or my mom's recipe for hamburger bundles with buttered egg noodles. My favorite fall recipe is baked acorn squash with butter, cinnamon, brown sugar and nutmeg... yum yum! Happy 10th! Happy 10th! My favorite thing to make is Potato Soap. I love making all kinds of soup and I am glad Fall is here! Bring on the SOUPS!!! Oh what a cute set of stuff! I've been trying a lot of new recipes lately and soon I'll be making soups too! But two of my all time favorite things to make are pancakes and scones. There is nothing better than a warm scone with jam and some milky tea. My favorite thing to make is my spaghetti with home-made meat sauce and home made garlic bread. Happy anniversary! My current favorite meal to make is Chicken Cacciatore. I have phases - in the summer, it's broccoli slaw, in the dead of winter, it's chili. My husband's favorite? Hands down, when I make strawberry preserves. He has quite the sweet tooth! Happy Anniversary! I LOVE baking CUPCAKES! I could eat this everyday!! Beef stew - particularly this time of year. I have a tiny oven that, if I ever move, I'm going to have to take with me because it cooks Beef perfectly (melts, no knife needed) every time. My current favorite dish is Basque Chicken with rice added. I mashed-up 2 recipes to make one that pleases everyone at my house. Sauce! I just made "real" sauce this year for the 1st time, I blanced tomatoes from our garden, and everything! And of course, I listened to Frank Sinatra the entire time my sauce was cooking because... well I just thought that was the right thing to do! Dorie Greenspan's banana bundt cake! Wow! Ten years! Congratulations! I haven't been to Wegmans since the late '80s in East Amherst NY on a soaking-down-to-the-underwear rainy day. I love cooking and eating Filipino food -- Chicken Adobo or Sinigang na Baboy (a tamarind based soup with pork and vegetables) -- like my mom taught me how. I've tried making the adobo in my crock pot, but it never fills the house with the comforting smells of vinegar, garlic and soy sauce like cooking it in a pot on the stove. Congrats on the 10 years! It was one day a long time ago after discovering your blog and some lovely little felt heart magnets that I discovered blogs!! Thank you for introducing me to this world! Being a Home Ec teacher there are loads of things but a good slice of pineapple upside down cake with a hot drink on a cold day is yummy! Blueberry cobbler, or blackberry cobbler or peach cobbler... You get the picture, right? 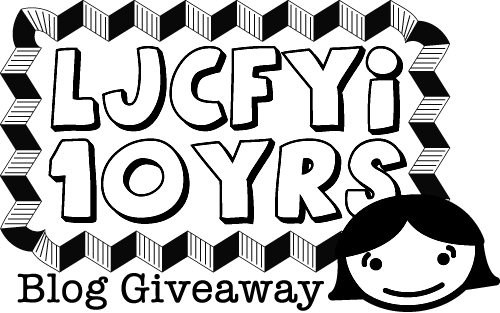 Happy blog anniversary ljc! Love making chocolate chip cookies. I get to use my mixer, it makes the house smell good, and there's nothing like a fresh baked cookie with a cold glass of milk. I've been learning to make fresh pasta, so right now, that is my favorite! I love to cook and eat Mac & cheese!! Wow! Congrats on your 10 year anniversary!! I love making mini donut muffins. They are cute, easy to make, and delicious! I like to make stir-fries. I guess because they are pretty fast to make! I love to make pork cutlets in a mustard/soy sauce marinade. It is a perfect weeknight "looks fancier than it the time it took to make" dinner. Plus it is super yummy! Filipino-style spaghetti...the defining flavor of the sauce is sweet! I'm a brand new vegetarian so my current fave is tofu! I just love it! As a Registered Dietitian, I am always looking for ways to incorporate unfamiliar health foods into dishes that are not-so intimidating for my patients and family. One of my favorite recipies was passed down to me from a co-worker and it is a hit everytime I make it: Harvest Quinoa Salad. Prepare quinoa according to directions on box: twice as much water to quinoa, cook just like regular rice. It can also be made in an electric rice cooker. I do not add salt while cooking quinoa. Cool the quinoa until it is room temperature. Combine approximately 5 cups of cooled quinoa with about ¾ cup vinaigrette. Add about 1 cup craisins, 1 cup chopped pecans, sliced scallions, and a teaspoon of salt. Mix well to combine and place in the fridge overnight. Taste the salad the next day. Sometimes the quinoa absorbs everything and the salad can taste too flat, so you may need to add some more vinaigrette and some additional salt. Enjoy this salad cold or room temperature! I love to bake (and eat) pavlova. The added bonus is that it looks mysterious and I end up looking very smart. with fall almost here I love making French Onion soup. My favorite dish depends on the time of the year - right now it's zuchini and fresh corn off the cob, sauteed with red onion and garlic and a dash of cumin and salt. All veggies from the Farmer's Market. Stuffed mushrooms! Man, I wish I had the things to make them tonight! Chocolate chip cookies, a classic and my fav of all time! Eeek- can't pick just one! I love making Giada's Lemon spaghetti, as its so easy. I also like making my zuchini bread- it makes two loaves so I have one to take to work to share! Favorite dish to cook is Big Bertha's Egg Bake for any time of day or night! A casserole of eggs, sausage, sharp cheddar, hash-brown potatoes, onions and fresh thyme make lip-smacking numminess! Cupcakes! I am known as the Cupcake Queen amongst my friends and co-workers. I love Martha Stewart's chewy chocolate ginger cookies. So good, and always a hit--I think it is because of the unexpected hit of ginger. I love to make Chili.. plain Jane chili with beans.. and Paula Deen cheese biscuits.. Cooking would have to be soup: I love creating original soups out of whatever's on hand. For baking: bread pudding. Perfect comfort food. Brownies from the Joy of Cooking - they are the best and sometimes I just get the deepest yearning for them. Lately I've been enjoying making vegan banana chocolate chip muffins (for my son with food allergies). Apple crisp this time of year. I love cooking biscuits and lemon curd. Yum! chinese porridge with dried scallop and wolfberry! SO many favorites but right now I'm having a craving for noodle kugel. :) LOVE all the purple btw in the giveaway. I've never heard of Cook's Country; will have to look it up! I cook really good chili and chicken tortilla soup. This time of year: apple gallette from Joy of Cooking! Definitely my family's Lemon Surprise Pudding... tasty, warming and perfect for a wet Sunday afternoon! My favorite dish ito bake is apple crostata! My favorite dish to bake is vegetarian lasagna. All of the work that goes into it is so worth it! Love to make lasagna and most any kind of casserole or pasta dish. Second on the list would be a yummy pot roast. Ancholadas=enchilads with ancho chili sauce. Time consuming so not made all that often, but oh so tasty! My favorite thing to bake is scones. Cook's illustrated has the ultimate recipe that produces a scone that is crunchy on the outside and tender in the inside. Right now it's hummus, but in a few weeks when the weather gets cooler I will be baking bread. My favorite thing to bake is cookies, I've been trying to lay off the cupcakes! I wish we had a Wegmans in SC. My favorite thing to bake is pizza rolls, with so much cheese they barely close. My favorite thing to bake is Oatmeal Chocolate Chip cookies, of course! my favorite dish to bake is brownies! I heart Wegmans. Too bad there's none around here. Baking, always baking. Probably a delicious fruit pie! I love making snickerdoodles with coarse salt, one of Martha Stewart's recipe. SO good!! And I love making a chicken and veggie soup using root vegetables like parsnips. What ever happens to be in season goes into the pot. Congratulations on 10 years, I have been reading your blog for most of them! I love baking lemon bars!